`To celebrate Harold Robinson's 70th Birthday the staff produced a presentation book which included the signatures of the 267 strong workforce. It provides a unique snapshot of the personnel and their activities at the time and has never been published before. This photograph of Harold Robinson was included in the presentation book and was taken by local photographer Pat Laurie. 124 Osmaston Road, Derby. The numbers alongside the signatures refer to the Index page which lists the various departments. You can search the list below using the Ctrl F function. Some of the signatures are difficult to read, and inevitably therefore I will have made some errors of interpretation. The large number of gilders, enamellers and burnishers does suggest a much higher level of activity than has been reported in previous accounts. It is interesting to note the relatively short list of painters. It would appear that Hague, Gresley, Dean and Birbeck were mostly employed on a freelance basis, often working at home, and were not therefore regarded as "staff". Furthermore from all accounts it would seem that when they were at the factory they were regarded "as very much a law unto themselves". If anyone has further information which they would like to be included please let me know via the contact page. I would like to add photographs of staff members in the "Archive Photographs" page as and when these are made available. If you can assist in this respect please let me know. 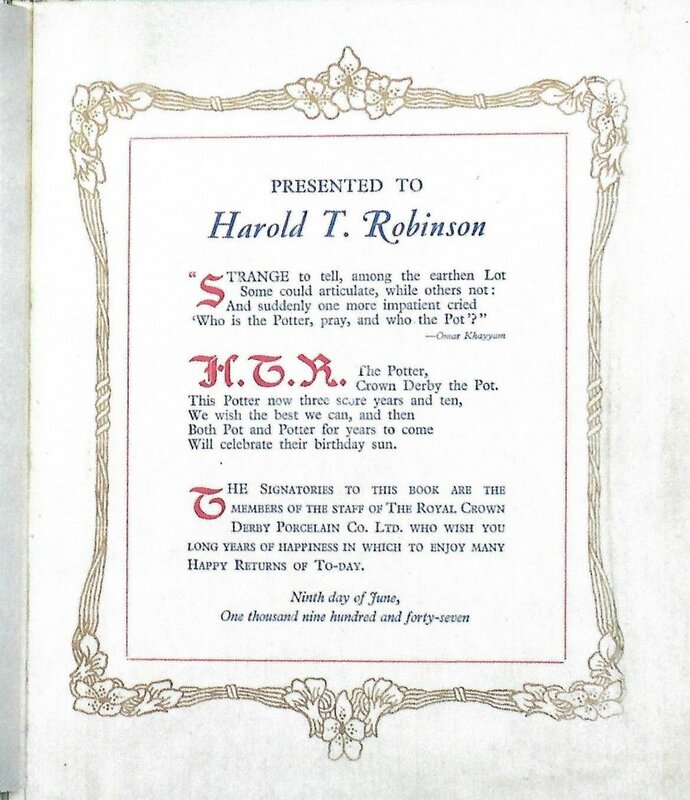 The above list is taken from the report of Harold Robinson's death which appeared in the Derby Evening Telegraph on Saturday 24th January 1953. Over 100 employees attended the service, and 39 names were recorded in the paper. I have listed the department where known. The list above is taken from the revised edition of Royal Crown Derby by Twitchett and Bailey and appears under Appendix IV "Enamellers employed since the Second world War" it was supplied by Brenda "Pip" Bentley and from this it would seem likely that the actual staff factory records have not survived. I have included it as it is such a useful reference. "Present" refers to the date of publication of the revised edition - i.e. 1988. In the post war period enamellers were permitted to sign their own work and the names above will therefore appear on pieces, especially figurines. I have amended the list slightly as the entry for V Akers was duplicated. I am aware of some omissions - e.g. Joyce Broughton is not included and in a previous article in "Bygones" I note that Betty Johnson was "Posy painting" from 1948-1953 and then returned to the factory later. I hope to be able to revise and add to the list as more information becomes available. Brenda Middleton has kindly supplied the following names which date from about 1957. Freda Elliott (Nee Booth), Margaret Cox (Nee Kinsey), Kath Armes, Frances Ainscoe (Nee Mountser), Evelyn Jones, Sylvia Howson, Elaine Whit, Jill Bland, Mary Townsend, Margaret Meakin (Nee Johnson), Margaret Gregory, Irene Jackson, Janet Atkinson, Pat Sale, Myra Harrison, Dilys Henson. Pauline Jackson, Elaine Hardwick, Mavis Hardwick, Pat Batty, Marilyn ?, June Chart, Sylvia Potter. Margaret Lane, Brenda Bratby, Lois Licence, Gloria Upton. Tom Sheldon, Emily Sheldon, Sheila Sheldon, Alan Sheldon, Tony Sheldon, Peter Sheldon. It should be noted that apart from the information above there are no records of gilders, burnishers or any other staff members available for the period as far as I can establish.